Objectors are fuming after being refused entry to Tuesday’s public hearing for the Heygate masterplan planning application. 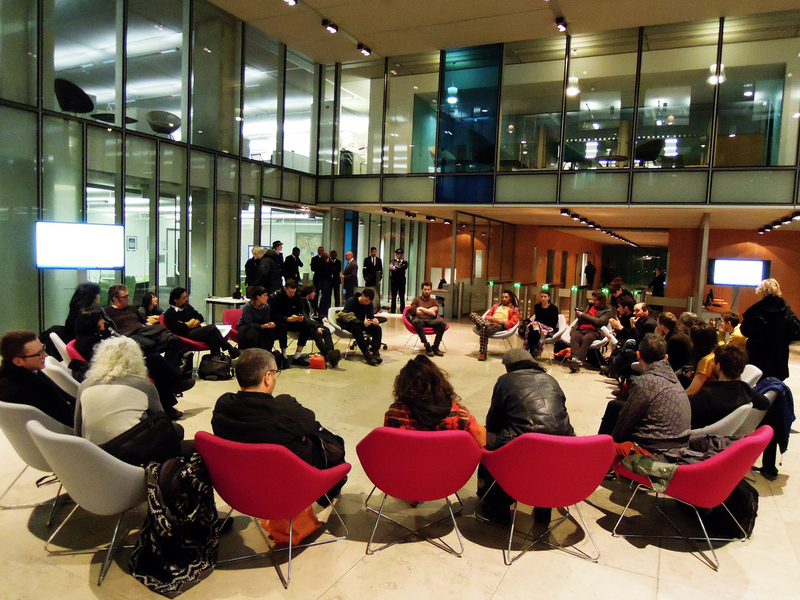 Over 40 local residents including members of the Wansey Street TRA, representatives from the Elephant & Castle’s Latin American traders and local priest Grahame Shaw were refused entry to proceedings at the council’s Tooley St. headquarters. A total of 102 seats had been allocated for the hearing, but objectors arrived to find that around half of these had already been taken up by representatives from the developer and the council’s regeneration & property divisions. With Southwark’s largest ever planning application and 300 objectors, a room with maximum capacity for just 100 people had been allocated to the hearing. Southwark’s Head of Corporate Programmes told waiting objectors that the meeting is full, and that if people put their names on a list then they would be admitted on a one-in, one-out basis. He apologised to objectors and explained that “We weren’t expecting to completely sell out”. Councillor Bukola subsequently emerged from the meeting to tell excluded objectors that ‘there are a sufficient number of objectors already in the room’…. Fellow objector and MP Simon Hughes later arrived to find objectors barred from the meeting, and immediately tweeted Peter John to complain about the situation. After much debate with officials, the planning committee’s legal officer finally intervened and the meeting was forced into recess. The 30 or so objectors who had stayed in the lobby, were then finally admitted at around 9pm - 3 hours into the hearing. Those objectors who had been fortunate enough to gain entry at the beginning of the meeting, made the most of the ridiculous 5 minutes allocated between them in which to make their representations. Among these were Jerry Flynn speaking on behalf of the Elephant Amenity Network and Adrian Glasspool representing the Heygate residents. In answer to questions, Flynn made a number of points including: concerns surrounding the large number of car-parking spaces proposed; privatisation of public realm; lack of clarity in the developer’s promise to retain some of the trees; lack of any renewable energy. His major two concerns though, were the masterplan proposal for just 79 social rented homes, and whether the scheme was actually financially viable - the report on the scheme described it as representing a ‘very big risk’ for the developer. Frustrated that such little time had been allocated for objectors to speak, some residents had prepared placards outlining their concerns. Planning Committee chair Cllr Nick Dolezal immediately halted proceedings and ordered those holding placards to leave the room. 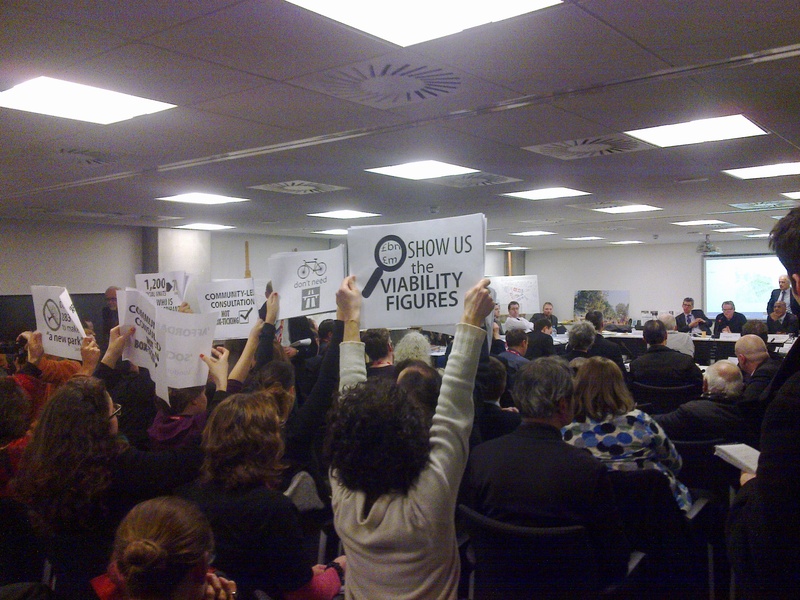 The meeting reconvened after Dave Walker from Southwark Mediation Service was able to persuade objectors to lower their placards. Those privy to the proceedings witnessed the expected approval after the committee accepted Lendlease’s assurances that they could indeed deliver the scheme despite the risk. The application went on to be approved with councillors predictably voting along party lines, with the exception of Cllr Crookshank-Hilton who abstained. Objectors had proposed a number of planning conditions upon this application, i.e. that the park should be managed by a trust, that a detailed RPA survey should be undertaken for the trees, etc. It was not made clear at the end of the meeting which of these, if any, were adopted. We were expecting a sell out, but - in the words of Southwark’s Head of Corporate Programmes: we weren’t expecting a complete sell out..